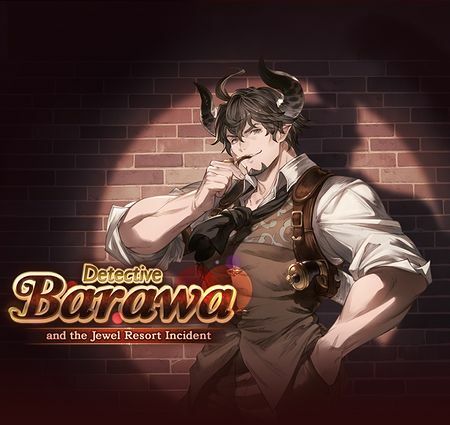 Detective Barawa and the Jewel Resort Incident is a side story that became available on March 28th, 2018. It is unlocked after completing Chapter 24 Story - The Immortal Beast . 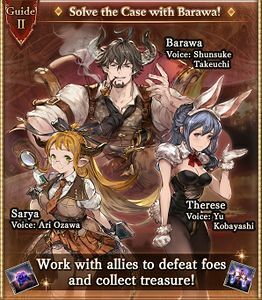 This event is part one of the Detective Barawa series. 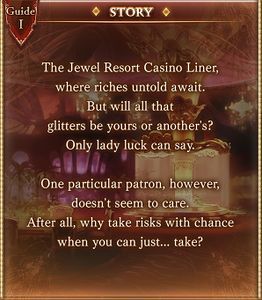 Part two is Detective Barawa and the Unfortunate Fortune. 5 Challenge Battle: "The Demon of Desire"
glitters be yours or another's? Only lady luck can say. when you can just... take? 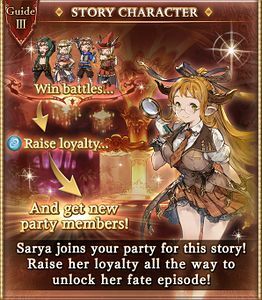 Fill the event character's loyalty bar to keep her permanently. Wind damage to one ally. 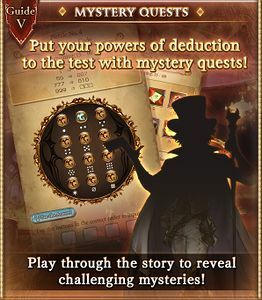 Challenge Battle: "The Demon of Desire"
This section contains solutions for all puzzles in this event! Avoid clicking the tabs if you don't want the answers to be spoiled! If you do not want to bother solving puzzles, simply fail the puzzle on purpose and select Give Up. You will proceed with the story regardless of the outcome. However, some puzzles can't be failed on purpose. You can tap "See the Answer" in game to simply show it. Any answers requiring text input are not case sensitive. The answer makes up a food chain, showing how the organisms are related with each other by the food they eat. The task of opening the door falls on a person who has survived. And to survive, sustenance is a necessity. For a bug, that is a flower. For a frog, that is a bug. For a bird, that is a frog. And as for the bird, it will set you free. Sustenance is nutrition or food. Thus, the solution is to tap the flower, butterfly, frog, then bird in order. As he will tell you repeatedly, Vyrn is not a lizard. Pay attention to the background, the crystal and the border orientation, and you will see it is the only one that is reversed, with the green end pointing towards the darker border of the image. Brightstone is the only item which consists of one word. One of these five passengers is the phantom thief in disguise. Passenger A: Passenger B is the thief. Passenger B: Passenger E is telling the truth. Passenger C: I'm the thief. Passenger D: The thief is not me. Passenger E: Passenger C is not the thief. All but one of the passengers are telling the truth. Who is the phantom thief? The thief and the liar aren't necessarily the same person. Read every statement carefully, because there is only one phantom thief and one liar. If Passenger A is lying, Passenger B must not be the thief, but that contradicts with Passenger B's statement that Passenger E is telling the truth when Passenger E says that Passenger C is not the thief, since there can only be one thief. If Passenger B is lying, then he immediately invalidates Passenger E's stagement of C not being the thief, because C himself is admitting he's the thief, resulting in two liars. If Passenger D is lying, then it contradicts with Passenger A and Passenger C's statement, which means there are three thieves. If Passenger E is lying, then Passenger B's statement is wrong, which means there are two liars. A paradox can happen if you negate all but Passenger C's statement. If he is the liar, Passenger A's statement is valid (that Passenger B is the thief), Passenger B's statement is valid (that Passenger E is telling the truth), Passenger D's statement is valid (he is not the thief), and Passenger E's statement is also valid (that C is not the thief). Passenger C is the liar; therefore, for everything else to be true, Passenger B must be the thief. Five gems (blue, red, yellow, brown, and green) are placed in formation. The brown gem is placed northwest of the yellow gem, with the red gem placed directly to the west. The red gem is placed southeast of the blue gem. The red gem is placed northwest of the green gem. A. The blue gem is farther west of the brown gem. B. The brown gem is directly south of the red gem. C. The yellow gem is farther east of the blue gem. D. The green gem is farther east of the yellow gem. E. The blue gem is directly west of the brown gem. A has the blue gem two "steps" away from the brown gem, ignoring the vertical distance of one (since the answer only states how far west it is). None of the statements invalidate this, so it is a possible answer. B is impossible. 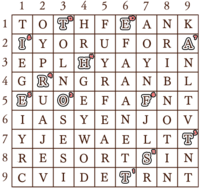 The puzzle states that the red gem is directly to the west of the brown gem; therefore, the brown gem can't be south of the red gem. D is impossible. The green gem is stated to be east of the yellow gem in this answer, but the red gem must be placed to the northwest of it. 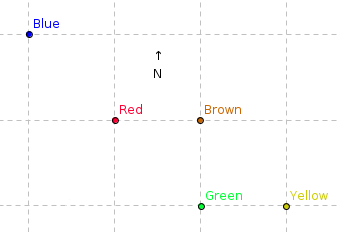 Since the red gem is directly to the west of the brown gem, and the brown gem is to the northwest of the yellow gem, it's impossible for the green gem to be east of the yellow gem. E is impossible. The puzzle states that the red gem is directly to the west of the brown gem; therefore, the blue gem can't be directly west of the brown gem. The answer is C, since the distance between the yellow gem and the blue gem is three "steps." This is due to the red gem being southeast of the blue gem, the green gem being southeast of the red gem in kind, and the brown gem being to the northwest of the yellow gem. This forces a distance of at least three. A survey was conducted on 100 skyfarers. 69 skyfarers are skilled with swords. 76 skyfarers are skilled with harps. 33 skyfarers are skilled with axes. 55 skyfarers are skilled with guns. According to the above survey results, which statement below can be proven with absolute certainty? A. At least 2 people are skilled with swords, harps, as well as guns. B. At least 9 people are skilled with both harps and axes. C. At least 1 person is not skilled with any of the listed weapons. D. At least 3 people are skilled with all weapons. E. No one is skilled with both harps and axes. 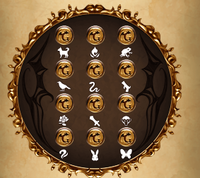 If you add up the axe and harp skyfarers, you get a total of 109 skyfarers - but only 100 skyfarers took the survey; therefore, at least 9 of them must be proficient in both, and thus the answer must be Choice B. 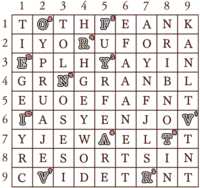 Note that while some of the other answers aren't necessarily incorrect, the puzzle demands an answer that can be proven with absolute certainty, and there is only one choice that would meet this criteria - while you can make similar arguments for most of the other choices, proving any of them, except for B, is impossible. If you look carefully, the "numbers" are actually spelling out a word in reverse - SWIPE. This is a hint to swipe/drag the screen. Doing so from the right to the left will give you the proper answer - Hide and Seek. If you look carefully at the symbols, you will realize that they all form letters, each overlaid on top of each other and rotated 90 degrees. Unscrambling the letters - H, P, C, U, and N - will give you the word PUNCH. Tap the screen repeatedly (that is, "punch" it), and the screen will "break," revealing the answer - Neko Punch. If you aren't playing the game on a phone, this may be tricky, but on a phone, it's very simple. If you tilt your phone, the block pattern winds up forming the word BOTTOM. This is a hint to swipe/drag the screen from the bottom up - revealing the answer, Iron Giant. This puzzle is indicating the measure in degrees between the hour hand's position and the number 12 on an analog clock. At 0°, there is no difference - it's 12 o'clock, thus, 0000. At 90°, it's exactly one quarter of the clock's face away - thus, 0300, or 3 o'clock. 165° is halfway between 5 o'clock (150°) and 6 o'clock (180°). Thus, the answer is 530. 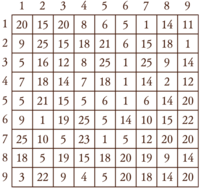 This puzzle is hinting to the player that the player should be counting by these numbers, and doing it in as few of them as possible. 15 equals one 10, and five 1s - 6 total. 90 equals one 50, and four 10s - 5 total. 999 would need nineteen 50s, four 10s, and nine 1s. Add them all up, and you get the answer - 032. Multiply each number separately, and then add the resulting digits together. 1 times itself is 1, and then added to nothing is still 1, so 001. 5 times 5 is 25, and 5 + 2 = 007. 7 times 7 times 7 is 343, and 3 + 4 + 3 = 010. Thus, for the final number, 9 times 9 times 9 = 729, and 7 + 2 + 9 = 018. Taking every fifth letter of the gibberish string yields the statement TITLE OF PAINTING COMIC 74, which refers to the Grand Blues! comic strip. The painting, with its title, is shown in the fourth panel. This leads you to the answer - LEGEND OF RACKAM. 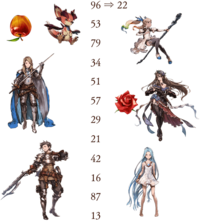 There's also an easter egg in this puzzle - if instead of reading every fifth letter, you begin with the first letter and go every fifth letter from there, you get the phrase THANK YOU FOR PLAYING GBF!. 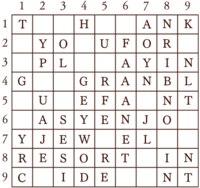 Each number taken from the table represents the letter position in the alphabet, 1 = A, 2 = B, 3 = C etc. 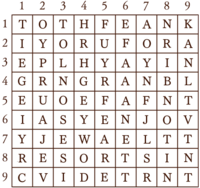 This is often called an A1Z26 cipher. The trick is that if you're attentive, you will realize that these numbers can be read in two ways. Doing it the way the hint suggests (column, then row) gives you the first half of the answer... but what if you actually read them by row, then column as well? Doing it that way instead produces a different clue altogether - TO THE FAIREST. Combine the two, and you get a reference to the apple that the goddess Eris threw after inscribing "To the fairest" on it - the Apple of Discord of Greek mythology. 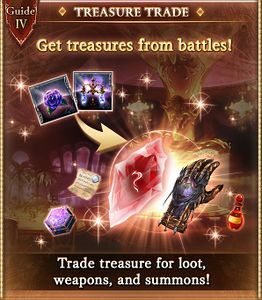 Much as in the other puzzle for this level, there is an easter egg, as well - removing the used letters of the puzzle from both the hints creates the phrase Thank you for playing Granblue Fantasy, enjoy Jewel Resort Incident. This page was last modified on 18 April 2019, at 20:36.